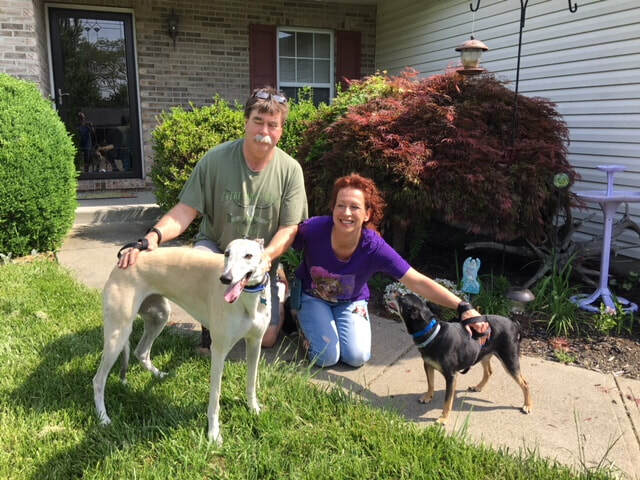 Sarah Smile is in her new forever home with Rex and Linda who live in Lawrenceburg, IN. They are greyt animal lovers, they recently lost a great dane and the little dog, Buddy needed a friend. Sarah gave kisses to Linda and Rex, followed Buddy around who showed her the house. After the tour of the house, Sarah laid down as is she has been in their family forever. She is a perfect fit for them and Buddy, even Snowy the cat wasn't concerned she joined the fur family. I'm confident we'll see Sarah and Linda at a lot of our GAGC events.